The visit of Japanese Prime Minister Shinzo Abe to India this September was much talked about in the context of the evolving Asian balance of power. Big ticket ventures including the Mumbai-Ahmedabad High Speed Railway were the highlight of the summit. But the larger issue of defence cooperation, especially a deal on military platforms and technology transfers intended to lay solid foundations for the bilateral relationship, did not see much progress. Abe’s speech to the Indian parliament articulating his vision for the Indo-Pacific region generated headlines as well as a strong conviction that the relationship is progressing on a serious note. And on the release of the Joint Statement, Abe said it would 'serve as a milestone to open a new era for the Japan-India relationship... based on that we will strongly promote Japan-India special strategic and global partnership to drive peace and prosperity for Indo-Pacific region and the whole world'. This strong diplomatic signaling notwithstanding, questions regarding the actual depth of India-Japan defence relations did resurface. Strategic rebalancing against growing Chinese ambitions has been on cards for the past decade since Japan, Singapore and Australia were inducted in the 2007 Exercise Malabar, only to face a hostile reaction from Beijing. With Japan once again joining Malabar as a permanent partner in 2015, the idea of an Asian strategic architecture led by the India-US-Japan triumverate once again rose to prominence. However, a reality check on the nature of India-Japan defence cooperation is needed. As far as regular strategic dialogues are concerned, there is indeed no dearth of bilateral mechanisms, as explained by Shashank Joshi in his commentary for The Interpreter. Besides the annual defence ministerial dialogue, there is the two-plus-two dialogue, Defense Policy Dialogue and numerous exchanges between senior military officials. The possibility of defence deals has also grown due to the warm personal relations between prime ministers Modi and Abe. But although Tokyo’s overturning of its arms-export ban in 2014 immediately raised expectations that New Delhi would become an early recipient of Japanese defence technology, the excitement was short-lived. 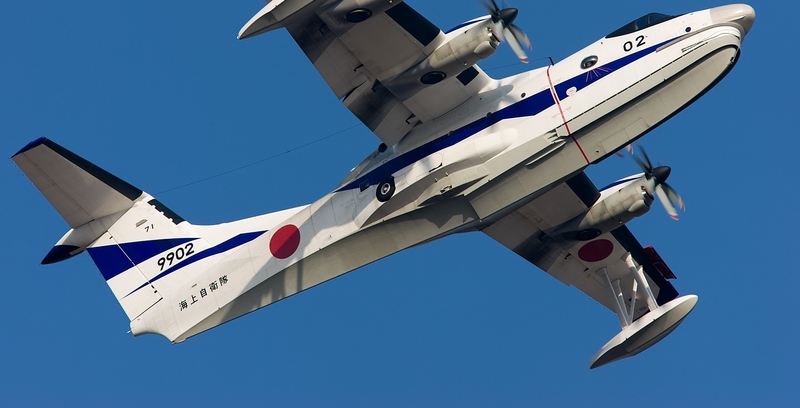 The possibility that India would purchase Japan's ShinMaywa US-2 amphibious aircraft, designed mainly for search & rescue and humanitarian relief, has divided experts since it was first offered to New Delhi in 2013. India already has the P-8I and the Tu-142 to perform maritime surveillance and anti-submarine warfare. So the US-2's role would be quite limited. Then there's the financial outlay of US$1.3 billion for just 12 aircraft. Also, the navy faces a shortage of helicopters, a more pressing requirement than the US-2. In sum, the driving force behind any US-2 purchase would probably be the belief that India-Japan defence cooperation has to start with something, rather than nothing. In light of China's rapidly advancing submarine force, the prospect of cooperation in anti-submarine warfare (ASW) has gained ground, and this found mention in the joint statement from this year’s India-Japan Annual Defense Ministerial Dialogue. The participation of Japan's largest warship, the Izumo, in the Malabar 2017 exercise was a recent highlight - ASW was a key theme in Malabar 2017 and Izumo has powerful ASW capabilities. The Defense Ministerial Dialogue statement also mentions Tokyo's agreement to field its P1 maritime patrol aircraft, known for its ASW capabilities, in Malabar 2018. Furthermore, the statement read that 'the ministers agreed to pursue exchanges and training by ASW aviation units such as P-3' (Orion aircraft). One other possibility is that Japan could have some role to play in India’s soon to be launched advanced submarine program, Project 75 (I), which entails construction of six submarines. Recently, the Indian Navy issued a Request for Information (RFI) to six foreign manufacturers for the €8.3 billion project, one of which is the Japanese consortium of Mitsubishi Heavy Industries and Kawasaki Heavy Industries. In the past, Japan has repeatedly refused India’s request for selling the sophisticated Soryu-class submarine for this program. The India-Japan defence relationship can be best described as a work in progress. With pressure mounting on both nations to materialise the strong bilateral relationship into a defence technology transfer partnership, the next couple of years could be crucial to see whether any progress can be made. The lack of concrete progress on defence deals leaves room for doubt that the partnership will remain limited to military exercises and dialogues among senior officials. But Japanese diplomacy is slow, which leaves some room to expect more.